Fernand Baudin Students Publications is a new, yearly, independent, experimental, speculative - perhaps fictional - low budget, highly ambitious, multilingual, critical and collective project. It is dedicated to forms of research on contemporary editorial practices. Initiated by members of Prix Fernand Baudin Prijs, it happens in connection with the belgian student’s context and the international publishing scene. It aims to create a common space between students and professionals, research and practice, thinking and making, ... through conversation, collaboration, love. The three first editions of the event - 2012 to 2014 - are very important years, for they propose to think about the format of this new kind of event and to shape it collectively, instead of imposing (an existing) one. Last year, F B S P focussed on the notion of event. What kind of events exist around publishing practices and what can we imagine for this specific project? It presented an exhibition of publications made by students, a program of lectures and a collective debate. The 2012 catalogue was thought as an event in itself, another moment, another space - taking further the discussions, allowing people who couldn’t come to participate through margin comments, etc. It is still in its (collective) editing process, and will be soon launched. This will also imply questioning the event in itself as a tool, and its different formats (exhibition, workshop, lecture, debate, screening, dinner, evening, party...) as ways of producing shared knowledge and critical thinking. Fernand Baudin Students Publications aims to be a collective and open project, at many levels, from its organisation to its different manifestations and productions. We believe that new technologies allowing more collaborative ways of working have a very interesting influence on publishing - making things public, shared with others - and we would like to inquire on that relation, and test (new) modes of editorial collaborations and collective editing. This is happening here, on the website. Not only a solution to give informations on the project, fbsp2013.be represents a platform for exchange on the event and the contents it carries, allowing people from other spaces and times to participate to the project. This is also happening in more situated places, physical places, and times. For we also believe that “meeting” is a very important ingredient for collaboration and community. We will then launch a few events to experiment on other ways of building collective critical thinking spaces, testing usual events modes (conferences, debates, exhibitions) and unusual ones such as dinners, concerts, parties, etc. Suggestions are welcome. Both kinds of platforms will of course interact, and feed each other. F B S P research crew is operating as a core group inside Fernand Baudin Students Publications, working on the project, meeting, sharing thoughts, expertise, producing papers, etc. In order to test several modes of collective critical thinking, Fernand Baudin Students Publications organises a series of situated workshops , happening in parallel to the official academical context - open to students from all schools, disciplines and academical years, and to a wider audience via email inscriptions. 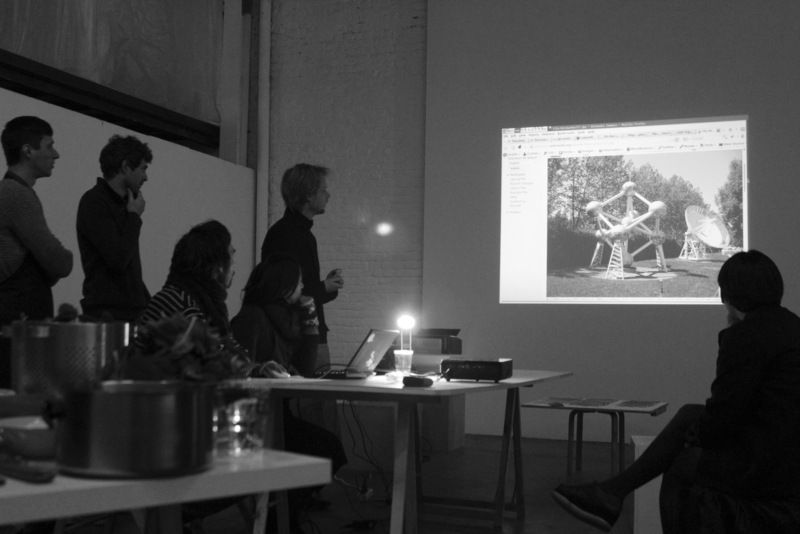 Sometimes hosted in the schools’ buildings, sometimes happening in other spaces, the workshops will turn around the notion of tools for editorial practices, approaching it from different axes, in relation to its guest place’s own problematics. 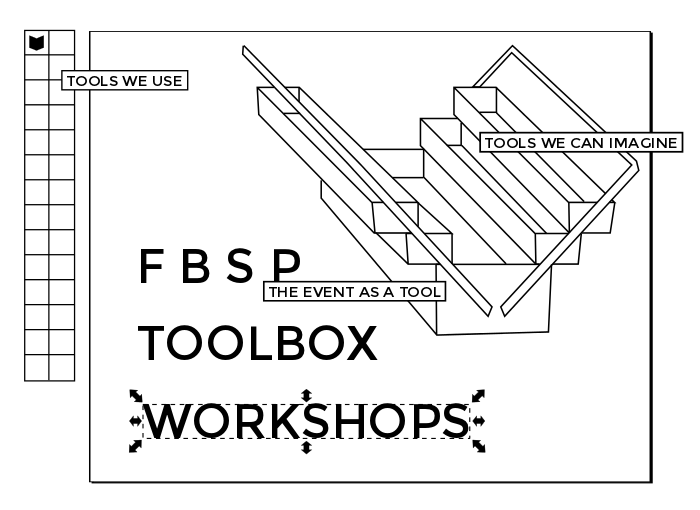 The collaborative working groups will progressively build a toolbox for the event, filled with questions, ideas, propositions, fictions... all kinds of tools needed to prepare and feed F B S P 2013. Contact us to participate, to share a thought, an idea, a request, a critic, to ask a question, or to support us in any way!